Twice each year we pause to honor the world’s most popular model railroad layout—the humble pizza. in a square, flat box. 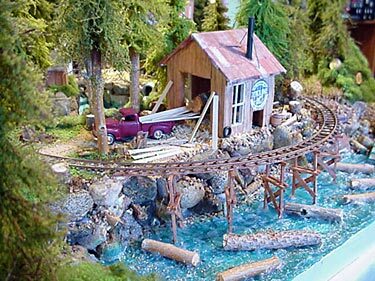 It’s obviously engineered to show off a model train circling endlessly, passing in review. and even super-detail it if they wish… it’s not hard to add details to a two-foot square layout! The result is often an exciting spectacle that can teach us all some new tricks. or are the scenic treatments becoming more attractive and engaging every time we feature these tiny displays? 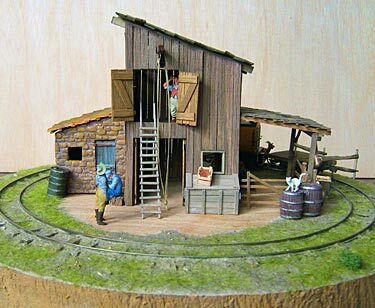 Well detailed rustic scenery decorates Fire Creek, California, an On30 (1:48 scale on 16.5mm gauge) line by Bob Wright, from Hollywood (honest! ), England. The line measures 1.5×0.75m (60x30in), and Bob explains, “The lower loop is just a circle; the upper loop has two storage sidings, one at the front and one at the back. 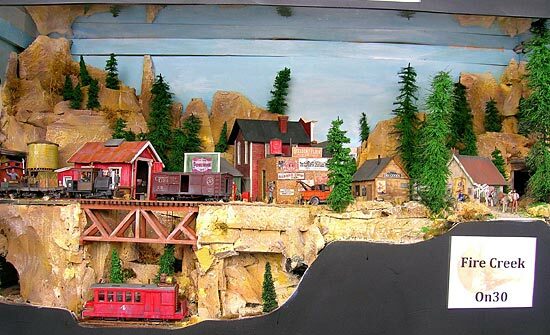 The layout was built for exhibitions so when the front side is folded up it’s a 5X3ft box.” Bob got the idea for Fire Creek from this website. Demonstrating the delight that pizzas bring to people all over the world is this commercial example of a “1:1 pizza layout at Al Mina Jameeya shopping center in Abu Dhabi, United Arab Emirates. Al Mina Jameeya translates roughly to ‘Cooperative Society at the harbour’.” Christian Klammer, a German citizen working in Abu Dhabi, spotted this attraction and snapped some photos for us. He estimates the gauge at 450mm, and the circle radius at 5-6m. 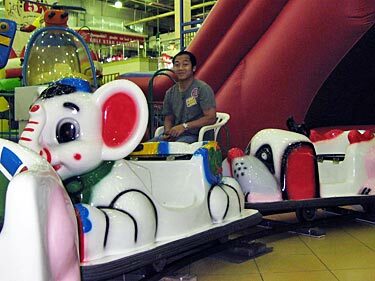 Notice that this ride appears to be successfully competing for attention with the helicopter carousel next door! 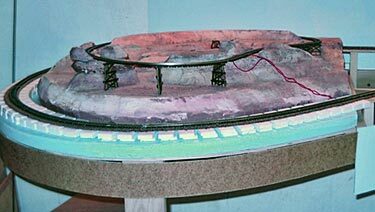 Christophe Beuret, from Neuchâtel, Switzerland, designed this N-scale 80cm (32in) diameter pizza in three sections with scenic dividers. Part A has a small town and station, with a jewelry factory served by the railway. Part B has a forest and lake, with a small station for tourists to visit the lake. Part C is a mountain with a gem mine. Christophe calls the railroad (what else?) The Jewel Pizza. 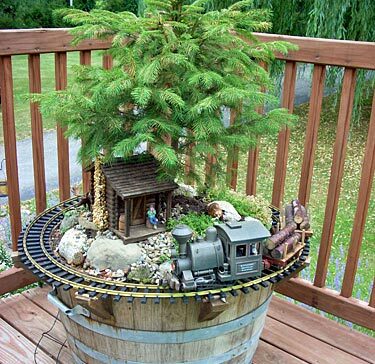 Operations will include passengers from A to B, and ore transported from C to A.
Shawn Viggiano, from Wantage, New Jersey, USA, built this very small G-scale garden railway from a 31-inch circle of sectional track resting on a set of brackets around the rim of a decorative wine barrel. He likes its flexibility: “Change it up for the season and holidays, add a water feature or combine a garden and water feature. 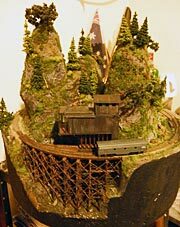 The one I did is a garden layout using rock to add some detail with ground cover and a spuce tree.” Here’s a nice video of Kittatinny Mountain RR. The result includes a tea stall, delightful small lake and a folly. 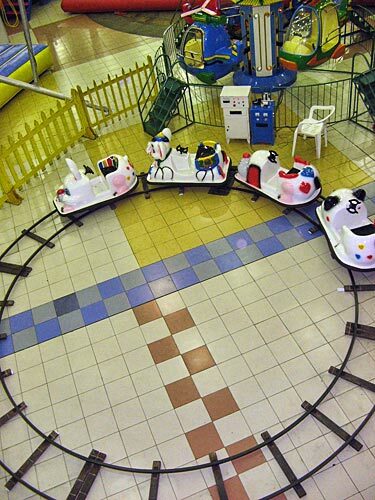 The loco circles the oval and automatically and reliably stops at the platform. 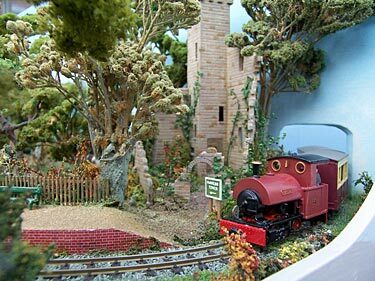 The Watlings exhibit this 36x70cm (14x28in) slice of countryside along with their other layouts including Fotherham and Grumblewick Coombe. Finn is two years old and in love with Disneyland and the Disney characters. 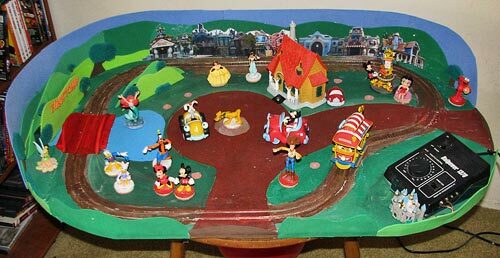 So his grandfather, Mike McCauley, from Simi Valley, California, USA, built him a simple, nearly child-proof layout featuring cartoon characters and scenery. Instead of being called Toontown, it’s called Finntown, of course! 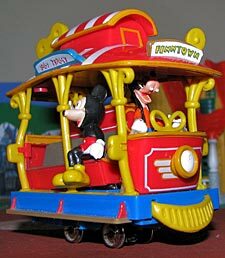 The train is a converted Toontown trolley mounted on a SPUD HO motor chassis. The figures are positioned with magnets and can be placed on any of the pink dots around the layout. 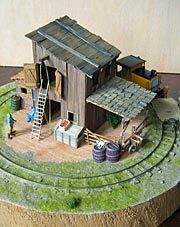 Yutaka Nakai (nicknamed Yuta), from Kyoto, Japan, built this unusual HOn30 (1:87 on 9mm gauge) layout in a nicely finished wooden box. When the lid is opened, the layout rises until it sits nearly at the top of the box, like a slow-action jack-in-the-box (see video below). Yuta likes both the safety and convenience of a layout in a box, as well as the unusual viewpoint of being able to look UP at his models! The layout is called Karakuri Layout, meaning “mechanism box in the layout.” For more, see Yuta’s web page. 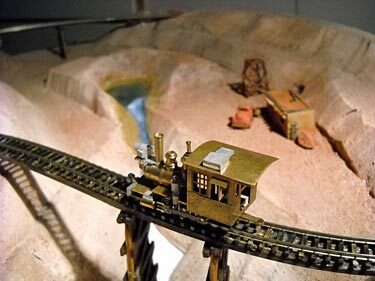 This mountainous little Z-scale pizza layout was built by Les Fulton, from Adelaide, Australia. He made it to explore the differences between N and Z modeling, but it stands well on its own. Jan Beeke, from Arnhem, Netherlands, built this 36cm (14in)-diameter On30 layout to provide children at an exhibition with “a ‘moving’, ‘smelling’ and / or ‘noising’ layout.” The barn’s prototype was featured on TV’s Little House on the Prairie. 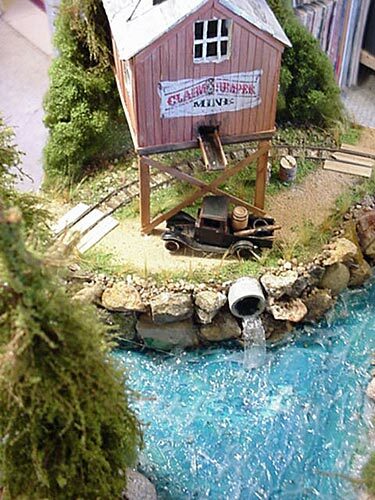 Desert Spring Mining Co. is a removable HOn30 pizza in a loop of a large N layout, built by Paul Mansell, from Seattle, USA. Brass loco is a Joe Works antique. There’s a video. Z SCALE LAYOUT IS A MOCKUP FOR A TT SCALE PROJECT! 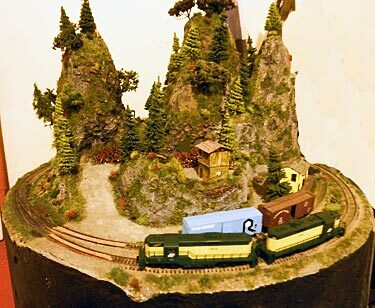 Leonid Moskalev, from St. Petersburg, Russia, built this 60x40cm (24x16in) Z-scale layout as a “preview mockup” to check his plans for a larger TT layout. It has three independent ovals and some very nice scenery. Soggy Bottom Boy Lumber Company is a single-loop pizza built by Ronnie Davis from Aurora, Colorado, USA. 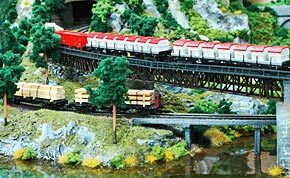 He has a nice touch with scenery, and has built a series of these narrow-gauge railroads that he calls his “cupcake layouts.” Ronnie likes to finish a layout, sell it, and right away start another.